Janet Yellen went to Capitol Hill today to be interrogated by some senators about the kind of job she plans to do once she’s confirmed as Chair of the Federal Reserve. Many politicians expect little from the Fed because they think it has less power and flexibility than it does. For its part, the right thinks it has exercised more power than it has. Yellen won’t transform anybody’s view of the Fed, but at least she has a sense of the gravity of our ongoing economic situation. Too bad the same can’t be said for some of the senators who interrogated her today. Ranking Republican Sen. Mike Crapo set the tone for his party in his opening statements by complaining about the Fed’s “unprecedented policies” in response to the ongoing economic crisis – without ever discussing the crisis itself. That crisis was, and still is, unprecedented in modern history. Crapo pressed the nominee on “normalization.” He didn’t use the phrase to refer to a “return to normal employment levels,” but rather to ask when the Fed would end its efforts to repair the economy. He also asked Yellen how she would “fix” Dodd/Frank, by which he presumably wanted to know how she would remove some of its regulatory safeguards, and complained about stimulus spending (which is outside the Fed’s authority). Sen. Bob Corker suggested that quantitative easing is nothing more than a way for bankers to make easy money, which of course it is (although Yellen noted that it also made life easier for middle-class homeowners). But Corker never offered any constructive solutions to our ongoing economic problems – and as far as this writer knows, he never has. Sen. Pat Toomey also joined the chorus, fretting about savings accounts for middle class households (most of whom have more immediate problems and beating up Yellen and the Federal Reserve for an economic situation that’s in large part the result of GOP inaction and obstructionism. In other words, Johnson had a firmer grasp on reality than his GOP counterpart. Sen. Jon Tester noted a lack of transparency in hearings of the Financial Stability Oversight Council. Sen. Johnson also mentioned the issue of transparency. Yellen was asked if she would support the Federal Reserve transparency bill introduced by Sen. Rand Paul. Democrats seemed to be the only people at the hearing interested in the issue of transparency, a topic which should have enjoyed bipartisan consensus. It’s not just that Paul is a libertarian conservative, or that his Republican father joined with Sen. Bernie Sanders to push for a Fed audit – a move which should be celebrated across the political spectrum. That’s one reason why Republicans should have been pushing for transparency. More importantly, transparency is also a key element of efficient markets, according to economic theory. So why weren’t conservatives, who claim to believe in the “wisdom of markets,” pushing for it? Yellen said she didn’t support the Rand Paul bill because she wanted the Fed to remain independent. Since the Fed is itself a creation of Congress, this might’ve been her weakest moment. That’s not to say she didn’t have a number of strong moments. She did. She began her remarks by talking about the ongoing unemployment situation. She reminded her listeners that the economy was “far short” of where it had been before the crisis. She responded to a question on the topic by pointing out the historically low levels of labor force participation, a statistic that often gets overlooked. And she noted that 36% of jobless Americans have been unemployed for at least six months, which is a historical high water mark. Yellen acknowledged that too big to fail banks have market advantage. She indicated support for stronger capital and liquidity rules for these banks. She said that the Federal Reserve needs to communicate effectively with the public, implicitly acknowledging that it usually doesn’t do so. 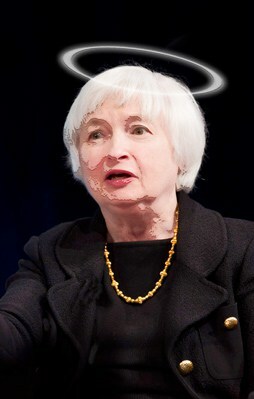 She was less effective when praising the “wise and skill leadership” of predecessor Ben Bernanke. But at least she made it clear that she, too, was grounded in reality as it exists outside the Republican bubble. Inside that bubble it’s still a dream world, where the pain of unemployment and wage stagnation never intrudes so nothing needs to be done. Which gets us to the limited frame of today’s discussion, and of most discussions of the Federal Reserve. As we said earlier, the bank is a creation of Congress. It has a very clear dual mandate: to manage monetary policy, and to keep employment at acceptable levels. For far too long it has ignored the employment side of its mandate (a mandate which Bernanke did not mention for quite some time after the crisis began). When it came to saving Wall Street, the Fed showed remarkable ingenuity and flexibility after the 2008 crisis. It allowed both Goldman Sachs and GE capital to retroactively become banks, for example, which placed them under its mandate and allowed it to rescue them. It began the “unprecedented” quantitative easing program, which continues to this day. Yet when it came to the other half of its mandate – employment – that flexibility and creativity seems to disappear. It could have promoted community banks and public banking. It could have linked its infusion of funds into the banking system with a requirement that banks begin a responsible lending program, especially to small and medium-sized businesses which could become the engines of job growth. It could still do those things. Instead it has flooded the banks with capital, allowing them to prosper for quite some time without offering many economically constructive loans. That benefited Wall Street much more than it benefited Main Street. The Federal Reserve was created by the American people. It should serve their interests, not those of the bankers it regulates. Yellen, a mainstream economist, isn’t likely to transform it into the central bank our nation needs. That may take a political mandate – one we’re not likely to see soon in our corporate-dominated political process. The Fed has become far too deeply embedded with the banking industry. This can be seen in its board structure, as well as in its policies,. Of the likely candidates to lead it, Janet Yellen was almost certainly the best of them. But that list was overly restricted by limitations – in both economic imagination and political courage. Janet Yellen will be a good Chair for today’s Federal Reserve. But the Federal Reserve needs to change.